up through the back of your spine"
Unfortunately, I do not have much TIME to write but I do want to mention a few things. I enjoyed a nice, delicious Thanksgiving Day last Thursday (featuring two separate vegan feasts, actually), during which time it struck me that in the last 5 years I've eaten a Thanksgiving meal in 4 different cities (New York, London, San Diego, Austin in that order). Yesterday I unloaded a stack of about 10 unwanted books at a used bookstore to begin the process of down-sizing to prepare for an upcoming move to a different apartment. This will mark the 5th time I've moved in the last 4 years. Prior to that I spent the first 22 years of my life living in the same bedroom, let alone the same address. At the bookstore I almost bought a couple of really cool-looking books that intrigued me, but decided at the last minute it didn't make sense to bring more books home when I'm trying to purge belongings. On the topic of TIME, though, the books bear mentioning. They were both part of the excellent Introducing... series published by Totem Books, a collection of paperbacks with illustrations and basic introductory overviews for a whole variety of topics. I can highly recommend the James Joyce, Friedrich Nietzsche, and The Universe editions and if there's anyone else you're interested in learning about (famous minds, but also concepts or historical periods are covered), this series of books is perhaps the best thing to look for. Anyway, the books were Introducing Relativity and Introducing Quantum Theory (for a total of $12), I will hopefully grab them at some point in the future when I get to settle down in a new place. In between our two Thanksgiving feasts last week, my girlfriend and I sort of randomly made our way over to the movies to see whatever was playing at that time. The film we saw was Martin Scorsese's new 3-D excursion Hugo. 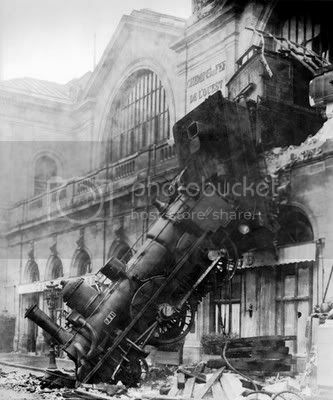 The young protagonist Hugo works as a clockmaker (or timekeeper) in the Montparnasse train station in 1920s Paris. Honestly, we had to leave the film early because of time constraints but it was an okay film. Visually beautiful but a bit slow-moving. The reason I bring it up is because of a brief but very noticeable cameo by none other than JAMES JOYCE himself. And, of course, after all the work I did on my big essay this year comparing Joyce and Salvador Dali (noting that there is no record of them ever having met), the scene shows James Joyce and Salvador Dali sharing a table at a café in the train station. It's one of the first scenes in the film. This morning I received word from the editors of the James Joyce Quarterly that they will have an answer for me within the next two weeks about whether or not they will accept my Joyce-Dali paper to be published in their journal. Very hopeful, very excited. 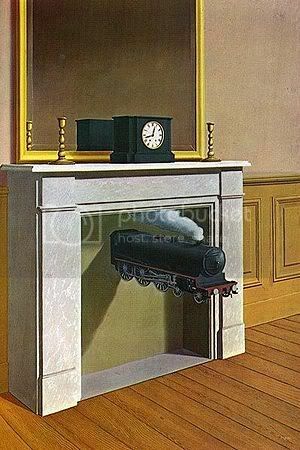 And here is a famous Surrealist painting called Time Transfixed by René Magritte. Although I'm not really familiar with the Scorsese filmography (for shame! I know! )I was wandering if you have seen his big movie froma few years ago, "The Departed"? There is a very prominent (but admittedly a bit silly) Joyce reference in the opening minutes. I suppose all this gives me more reason to sit down and crack through all his films one of these days! Thanks for commenting. I have seen that film a few times actually, but somehow I never picked up the Joyce references. I remember reading somewhere afterwards that the title and theme derive from "The Dead," though. Along these same lines, Robert De Niro directed a film called "The Good Shepherd" which featured a few key references to Joyce. Somebody did a presentation about that film and the underlying Joycean elements at the conference I attended in Pasadena this past June but I didn't get a chance to witness it.